It wasn’t St. Patrick’s Day but luck struck twice last Monday on Winloot as we had not one but two different Winloot Members match 10 out of 10 numbers in our Instant Win Bonus Game within hours of each on 11/9/15. 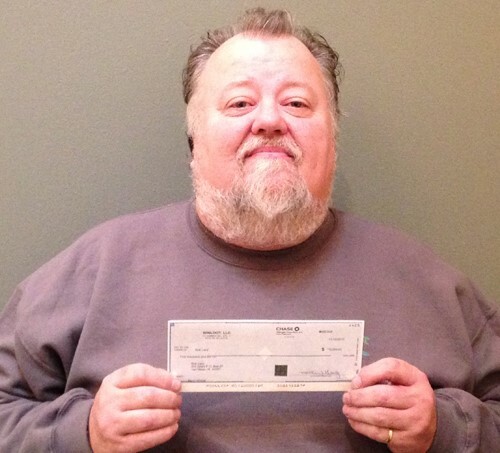 Our first $5,000 winner of the day was Bob Lacy from the friendly town of Van Meter, IA. In fact, when we wrote to Bob to make sure we had his address right, he wrote back to let us know not to worry too much because as Bob said, with a population of 1,016, everyone in Van Meter knows each other. Well, whether it was the post office or one of Bob’s terrific neighbors, as you can see below the check arrived and Bob was kind enough to send us a picture along with a note of gratitude from his wife who we’re told will be the beneficiary of a new winter coat. Just a few hours after Bob’s big win, Beverly Rochon also matched all 10 numbers in the Winloot Instant Win Bonus Game to claim a second $5,000 prize. Beverly didn’t let us know specifically what she’s going to do with her prize money but it’s safe to say that with the holidays fast approaching the money will come in handy. Please join us in congratulating Bob and Beverly and don’t forget to play Winloot today for your chance to win an instant cash prize. Just the other day we announced the winner of two separate $5,000 winners in our Instant Win Bonus Game. Well, now we have a third $5,000 winner in the same week. Anthony Prude of the Motor City, that’s Detroit, MI for those not familiar with the rich history of this great American city, matched 10 out of 10 numbers on Saturday night and is our latest $5,000 winner. Anthony has been playing Winloot and our Instant Win Bonus Games regularly and his loyalty has paid off handsomely. If you’ve played the Instant Win Bonus Game then you know the excitement of watching those winning numbers ring up every time you get a match. Imagine how Anthony felt when he rang up all 10. Every game is a new chance to win a cash prize so we always encourage Winloot members to play every day. Did you play today?